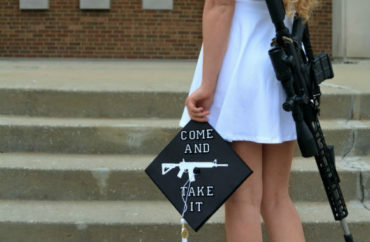 You may remember reading about an open-carry rally at Kent State University a few months ago, featuring an alumna who became famous for her graduation photos with an AR-10 rifle. It turns out the public university spent $65,000 on security to protect the event from “violent threats and significant protests,” according to the Foundation for Individual Rights in Education. When the student group Liberty Hangout invited alumna Kaitlin Bennett to campus for another gun-rights event earlier this month, the university demanded it pay security fees, even though Liberty Hangout did not sponsor the September event. Evidently Kent State didn’t count on getting hit with a temporary restraining order against its attempt to punish the student group for holding views that offend some protesters. Cleveland.com reports that U.S. District Judge John Adams questioned whether Kent State’s security-fee policy is constitutional. Adams said the policy was too broadly written and didn’t determine what would happen if protestors got inside the auditorium. The judge was openly frustrated with the lack of communication between Kent State and Liberty Hangout, asking if the group was involved in security discussions at all. Adams wants more information about how the university calculated the security cost charge. There is a five-person team who determines the level of security for sponsored events, according to court documents. The judge barred the university from charging Liberty Hangout $1,800, which the group couldn’t afford to pay, and scheduled a Dec. 13 hearing on a possible preliminary injunction. It ended up not mattering in this specific case, as Kent State relented and covered security for the Nov. 19 event. “Liberty Hangout’s victory demonstrates the folly of open-ended university security fee policies,” Zach Greenberg, program officer for FIRE’s Individual Rights Defense Program, writes in a blog post. “It’s well-settled law that universities cannot saddle student groups with the costs of security when the sum is based on the content of their speech or the expected reaction to their expression,” he said, quoting a Supreme Court decision that said the government can’t side with “bottle throwers” by financially penalizing unpopular viewpoints. “Considering that many universities are billion-dollar institutions bound by the law or their own policies to protect First Amendment freedoms, it is the university — not the student group — that must be the final guarantor of the security required for students to exercise these freedoms,” Greenberg writes.